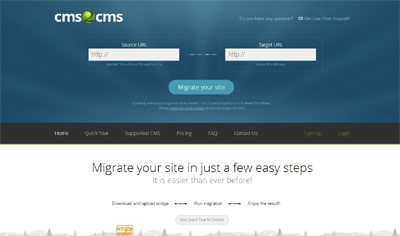 CMS2CMS is the online service for automated content management system migration. It is designed to ease the process of CMS migration and make it maximum straightforward and swift. CMS2CMS is a totally web based service, so you won’t need to install any software and avoid additional load for your computer. It is faster than any other way of CMS migration – the process will take from a few minutes to a couple hours to be completed. With CMS2CMS, you’ll forget about hours of copy/pasting and save your time and money. since it is available for totally FREE now! Don’t let your CMS limit your possibilities, move on! With CMS2CMS, it’s easier than ever before!